She thought it was just a children’s book about funny animals. She couldn’t be more wrong! When we go the bookstore to buy books for our kids, we usually take our time to make sure that our youngsters will get something good out what they ought to read. But when we are in a hurry, we skip flipping the pages and simply pick the ones with most attractive cover. And that’s where our biggest mistake happens. The hilarious story of a grandmother buying the “wrong” book for her granddaughter can be a good example to this. Six-year-old, Emmersyn, felt overjoyed when her grandmother gave her an animal-themed picture book for a present. But as she goes through the supposed “story,” she discovered several words that she could not even understand. This grandma surprised her granddaughter with a new book but the child’s parents were shocked to see its content. Confused, the young avid reader went to her parents to help her comprehend what’s inside the book titled “If Animals Could Talk.” The kid’s mom, Tiffany, was in shock with what she saw as she browsed through the pages. The dad was also surprised and asked Tiffany if the book was meant to be a joke to them and their daughter. The grandma bought the book titled “If Animals Could Talk” as it boasts a cute illustration of an animal on the cover. Apparently, Tiffany’s mother picked an adult book instead of a regular picture book. The book was filled with swear words and other sensitive terms that are absolutely not for kids to read. Tiffany then phoned her mom to ask about the book she just bought and found out that the clueless grandmother didn’t care to look into the content. She apparently took it as a kiddie book because of the animal illustrations. Tiffany took a look at her 6-year-old daughter’s new book and was surprised to see its content. Tiffany then took to Twitter to share her mom’s hilarious mistake. The grandmother reportedly got the book from the popular U.S. bookstore Barnes & Noble. Amused by the incident, Tiffany shared the hilarious mistake on Twitter and left some photos of birds saying “mutha f*cka” and other more animals saying other swear words. The mistake was indeed ridiculous and everyone was laughing with thousands of users leaving load of comments on her viral tweet. Tiffany shared more photos of the pages where more “adult” words were used. Next time we buy books then, we should spare at least a few minutes to check on the content. Because apparently, some adult book authors already use kiddie stuff to add humor to their creation. Tiffany phoned her mom to ask if she saw the book’s content and apparently she did not. The mom shared the rest of the pages on Twitter too. This douchebag learned his lesson the hard way! Safety rules are implemented for very obvious reasons. If you choose to keep ignoring them, you have to be ready to face the consequences – one way or another! Just take it from this guy who decided smoking in a gas station was a good idea. Eventually, he learned his lesson the hard way and we have good reason to believe that he will think twice before doing the same deed again. What a jackass! This guy smoked while at a gas station – despite being told several times to stop. They surely know how to greet people at airport arrivals the right way. People all have their own fair share of airport experiences, most especially to those who travel a lot. And most of the time, these experiences are quite memorable. But it can’t be denied that hurtling on a plane for hours can be exhausting. After all, no one wants to wait. Interestingly, people have found ways to make arrivals a bit more exciting. It basically involves going to an airport with a little twist of creativity. In this article, we’ve collected some of the best – and especially unforgettable – airport greeting signs. And yes, you guessed it right – all of these captured everyone's attention. This is not meant in any bad taste, but their obliviousness and constant struggle to keep up with the ever evolving technology is very entertaining to watch. Like this list for example - it contains a few examples of our parents mistakenly using smiling emoji on their messages. 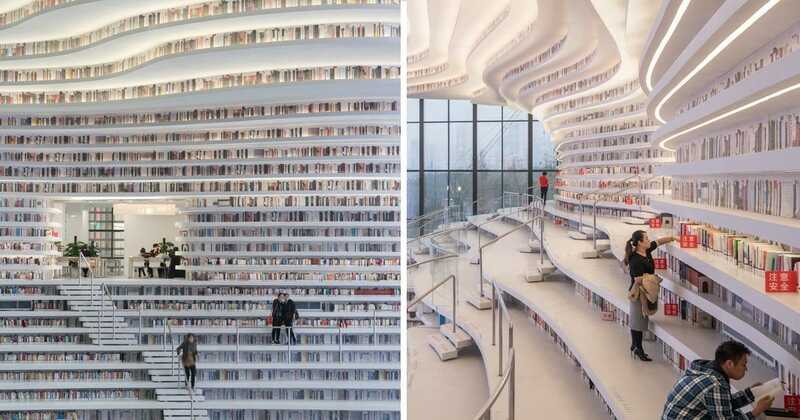 China’s Massive New Library Is The Most Futuristic Ever!